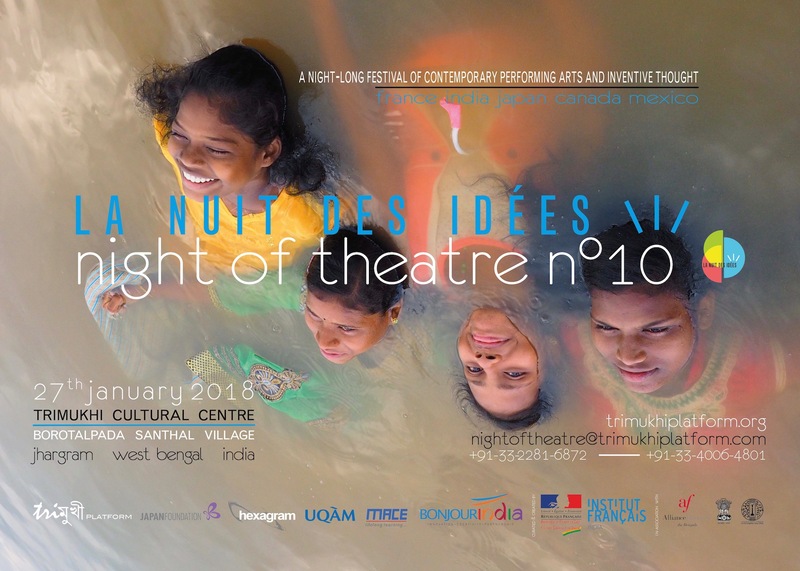 Night of Theatre n°10 • La Nuit des Idées, amazing night-long festival of contemporary performing arts and inventive thought, took place on January 27 2018 at Trimukhi Cultural Centre in the Santhal tribal village of Borotalpada, West Bengal, India. Artists and philosophers from France, India, Japan, Canada and Mexico together with actors, dancers and musicians from Borotalpada village both showcased in situ sound, theatre, dance or dance-theatre performances and evolved in philosophical proclamations as well as in stimulative discussions about “flows of intensity”… before inviting all to join for a joyful dinner and then for a joyful multicultural dance party until the sun rise again… This event was part both of Institut français’ international Nuit des idées (“Night of Ideas”) to celebrate all over the world the stream of ideas between countries, cultures, topics and generations, and of Bonjour India, a four-month-long celebration of Indo-French innovation, creativity and partnership. ATANG DARAM • ONE DAY WILL I EXPLODE? 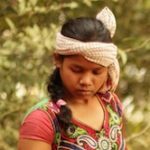 Trimukhi Platform‘s concern for questioning the contemporary ways of fabricating and enjoying arts works has taken a double shape: the organisation of a night-long festival in Borotalpada village and the publication of a bilingual journal in Kolkata. In this context, Nicolas Idier (Book office, Institut Français in India) and Jean-Frédéric Chevallier (Trimukhi Platform) invited Anjum Katyal (India) to discuss about the dynamics at the heart of Trimukhi Platform French-Indian publication Fabrique de l’art • Fabricate (Fabric of) Art and Barbara Cassin (France), Elodie Guignard (France), Marc Hatzfeld (France), André Eric Létourneau (Canada), Ikue Nakagawa (Japan), Fabrice Plançon (France, India) to share their thought after their experience in Borotalpada village for Night of Theatre • La Nuit des idées. To enrich the evening, after an introduction by Masayuki Taga (Consul General of Japan in Kolkata), Ikue Nakagawa (Japan) performed a solo dance she created few days before in Borotalpada village for Night of Theatre n°10 • La Nuit des idées and to stimulate the production of thought, wine was offered by the General Consulate of France in Kolkata. It is so utterly dark that you need to reassure yourself that you possess a right hand by reaching out and touching it with your left. The others who are gathered with you are absent presences – they cannot be called ‘shadowy presences’, for there are no shadows here, only varying degrees of darkness. Then something happens – maybe a sound begins taking on something approaching articulate shape somewhere to your left, or perhaps a beam of light from a torch illuminates the figure of a woman a hundred metres away carrying something on her head, or then again it might be a bunch of strange luminous caterpillar-like objects flying up into the air and falling back again into what seems the illimitable earth. Or, maybe it is all three at once. You remind yourself that this is not some kind of bizarre psychedelic dream but a performance you are watching, over 200 kilometres from your city home, on the edge of a remote Santhal village in Jhargram, with no ambient electric light interfering with your peripheral vision and the broad, star-burst sky spread out above you. It’s close to midnight and you’ve been travelling and sitting, and watching, and listening, and talking since eleven in the morning – thirteen hours gone and you are still struggling to take it all in. But it is a struggle that you engage in willingly for this is something that you have never experienced before. Unexpected and strange in a myriad ways, but also reassuringly familiar and intimate, rather like an extended adda with newly-acquired friends. This, more or less, is part of the experience of anyone who attends one of Trimukhi Platform‘s “Nights of Theatre” – a night-long celebration of the human spirit through performance and laughter and joyous conviviality that leads to thinking (and thinking through) some aspects of life and living that one does not often encounter in a performance. It happens every winter, around Pous Sankranti, and this year it is scheduled to take place on January 27, 2018. The three facets of Trimukhi Platform‘s work invoke “artistic creation, thought generation and social action” – a triumvirate that Jean-Frédéric Chevallier, Trimukhi’s artistic director, stresses must not be separated, but seen as three sides of an integrated whole. Chevallier, a Frenchman who has lived in India for the past decade (and is married to a Bengali), is a trained philosopher, with a doctoral degree from the Sorbonne, Paris, and a decade’s experience as a university teacher, first at the Université de la Sorbonne Nouvelle in Paris and then for seven years at the National University of Mexico. He turned his back on the safety of his cushy job in Mexico to come and work in a place that does not even register as peripheral to us city-folk. When introduced to Jean-Frédéric nearly a decade ago by Ananda Lal, professor of English at Jadavpur University, a man who has forgotten more about theatre than I will ever know, I was immediately suspicious – what was this White man with the aristocratic surname (chevalier = knight, in French), and a doctorate from Paris, doing in some back-of-beyond tribal village in distant Jhargram? Was he some kind of neo-Orientalist evangelist, who had come to our backwater to ‘civilize the savage’? Was he out to stake claim to uncharted (for Western academics) territory in hope of future fame? Talking to the polite and graceful young(ish) man allayed my suspicions somewhat. It seemed all he wanted was to know if he could put up a performance at Jadavpur University which seemed innocent enough. But when I began to ask him what his requirements were, my suspicions were aroused again. What kind of auditorium did his team need? No need for an auditorium, said Chevallier. What about lights, sound, and so on? Nothing. Nothing at all. What kind of theatre was this, I wondered? Could it be called theatre at all? 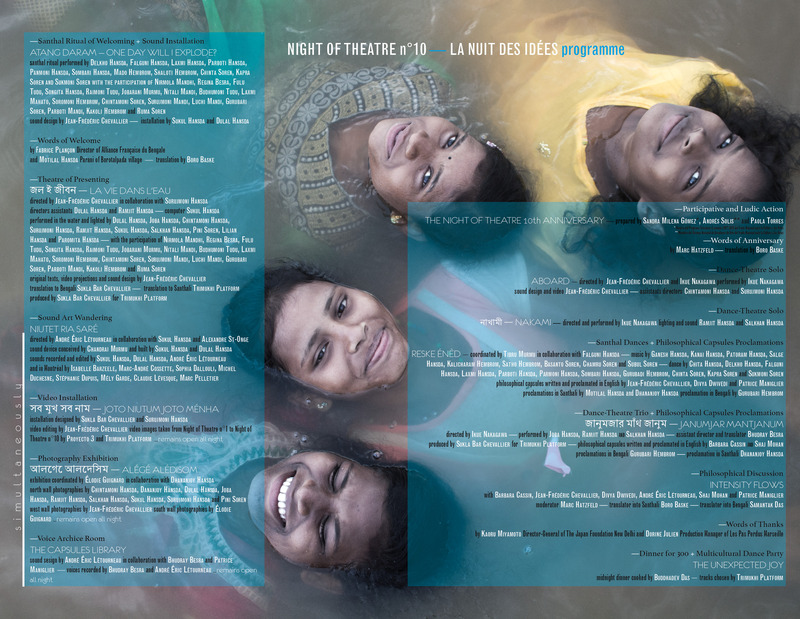 It was this that prompted Jean-Frédéric to suggest to fifteen people from Borotalpada that they collectively produce an experimental stage work, which finally took form and shape as Monsoon Night Dream. It had no characters, no story to speak of, no conflict, merely an invitation to contemplate, in a simple, direct fashion, the presence of seven women, three men and four musicians who, sometimes, performed quotidian actions from their daily lives, sometimes parts of dances, or sometimes just stood there, looking straight at the audience. Intriguingly, this very non-dramatic-ness created its own narrative/s, with each member of the audience taking away from the performance his/her own personalized story. In the process, Trimukhi Platform not only successfully built a bridge between two very different sets of cultures and peoples but it also became a means to enjoy, celebrate and partake of the diversity of our part of the world.In the nine years since then, Trimukhi’s performances have often been followed by sessions of intense sharing of thoughts, ideas, opinions, from members of the audience and between them and the performers. More remarkably, their productions are no longer the brain children of Jean-Frédéric or Sukla; several pieces have been created by members of Trimukhi Platform, with or without inputs from their director, making their works truly collaborative creations. It is time now perhaps for those closer to Jhargram to subject Trimukhi Platform’s work to similar critical scrutiny. The author is professor of Comparative Literature, Jadavpur University, and has been working as a volunteer for a rural development NGO for the last 30 years.